Try your first 15 minutes FREE. Use before or after a massage, facial, acupuncture, or counseling/psychotherapy. Uses the placement of heated stones on the body to help relax tight muscles and increase local blood circulation where applied. This is a form of therapy commonly found in spa settings. The hot stone therapy offered with the Inframat Pro, however, is a much more complex process. 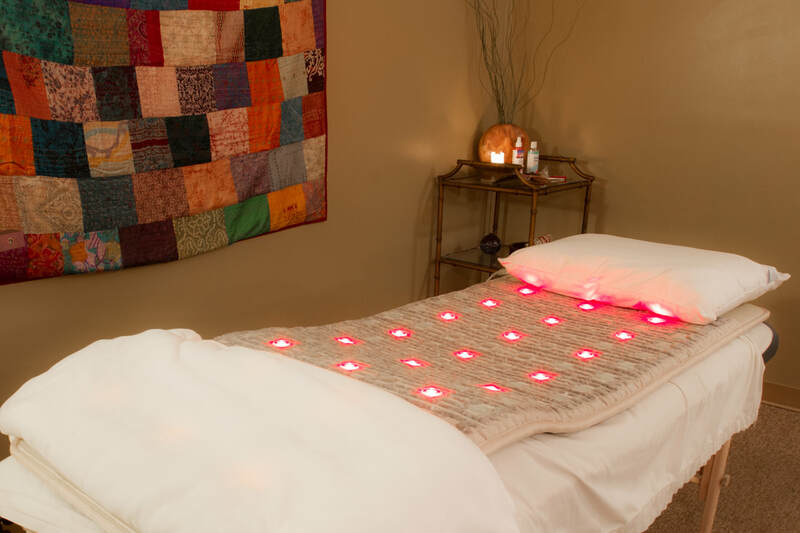 While you get all the typical experiences associated with hot stone therapy, these benefits are greatly amplified by the gemstones incorporated in every mat. The Inframat Pro is available in many different models that use a combination of tourmaline, jade, or amethyst. These gemstones are natural conductors of far infrared rays and negative ions when they are activated by the heating technology. These additional processes may help improve the effects your body will receive from hot stone therapy. Far Infrared (FIR) TherapyFar infrared rays are a necessity to all living life. The main source of FIR is the sun. Using an Inframat Pro exposes you to these rays of invisible light when the heating technology activates the natural gemstones. These rays penetrate 4-6 inches into the body’s tissues. The benefits can include increased oxygen movement, decreased pain, inflammation, and stiffness. FIR therapy promotes relaxation that leads to higher levels of wellness. One way to receive FIR is saunas, however, these saunas are expensive and sometimes inaccessible to people. Each Inframat Pro comes with a foil blanket that can be used to trap the heat as you use it to recreate this sauna-like effect. Negative Ion TherapyNegative ions are abundant in nature and vital to wellness. Just like stepping away for a breath of fresh air, a dose of negative ions can shock your body with a refreshing jolt. Negative ions attract harmful positive ions and pull them down to the floor, reducing the number of airborne toxins you are exposed to on a daily basis. As a result, negative ions work to improve your wellness and help with the removal of harmful metals from your body. Negative ions used in conjunction with FIR stimulate the body from the inside to rapidly increase the speed and quality of other forms of treatment and recovery. Photon therapyUses light particles that can help correct bio-magnetic imbalances in the body as well as help reduce blockages within the body’s systems. It has also been shown to help the cells break down and release stored up toxins, promoting better overall wellness. Photon therapy has been used for years as a supplemental non-medicine pain reliever and anti-inflammatory. HealthyLine Inframat Pro models that have photon light therapy are equipped with 6-12 LED lights that emit red photon light on the body. It is important not to block the light from making direct contact with your skin or else its full effects will be blocked. PEMF TherapyPEMF, or pulsed electromagnetic field therapy, is a process of applying magnetic fields of a particular frequency to the body. HealthyLine bases its PEMF technology on the variables that have been proven to be effective based on the majority of studies which is a PEMF at 7.83Hz (or approximately 8Hz), 3000 milligauss, and using a pulsed sinusoidal wave. This combination brings maximum effectiveness with simplicity and reduces complications. It is also the combination that is most in line with Earth’s natural magnetic field mimicking its frequency & intensity which is most compatible with our bodies’ natural biorhythms. It helps the body return to the proper level that the Earth has accustomed it to for years. Want your own mat? Ask our Office Manager how BIT can help you order one of your own.